Premiering in the fall of 2008 is a new, fantastic online community, that will provide consumers the unique ability to buy and sell their garage sale, estate sale and yard sale possessions, within an international marketplace. Consider this a virtual garage sale, not an auction website, where consumers around the world will have the ability to sell their items for a single listing fee, or buy at their leisure, 24 hours a day, 365 days a year, without gas expense or weather worries. The ideal members of this "Garage Sale Genius" community, to name a few, are people who love to shop as a hobby or sell to preserve their lifestyle; a cabinetmaker adding a new tool to his collection; retirees downsizing their household; women browsing city boutiques for vintage clothing or estate jewelry; a college student shopping for essentials and trendy items for a dorm room; a crafter displaying their new design; an inventor introducing a new invention to the marketplace or a business owner promoting new merchandise or reducing their inventory. I have been incredibly lucky to have had the pleasure in working with the owners of this amazing and ingenious company on different projects, including revamping their company logo and creating a spectacular postcard design, that will be used during their initial launch phase. I am thrilled about their upcoming premiere and in knowing that Garage Sale Genius is going to be a phenomenal success. There is a little genius in all of us, and this fall, Garage Sale Genius (http://www.garagesalegenius.net/) will assist you in buying and selling your treasures. 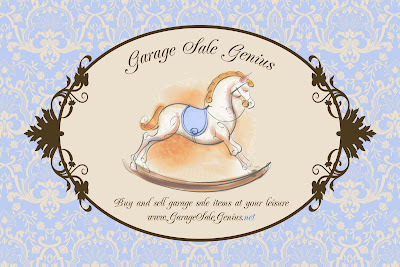 I am looking forward to going into the new website, Garage Sale Genius, in the fall. I love your designs, they are very unique!